This is another in a series of occasional posts on quantitative analysis. I am indebted to Josh Brown for pointing me to an article by Larry Swedroe, which discusses a study on demographics and real interest rates. While I found that I can derive significant insights from single variable studies like these, the world is more complex and univariate analysis illustrates the pitfalls of relying on single variable models. More at our new website here. The Humble Student of the Markets blog will become a subscription driven site on December 1 (see Why this isn't investment advice (and a site update)). The new site is live now at humblestudentofthemarkets.com, Please come by and take a look and please change your bookmarks accordingly. We are scheduled to open to subscribers on December 1, but we are having some glitches with our payment system that we are trying to solve. We will have that up ASAP. In the meantime, all content is open to the public for the time being. Media, press professionals and blog aggregators with email domains confirming their affiliations are invited to apply for free subscription access (cam at humblestudentofthemarkets dot com). 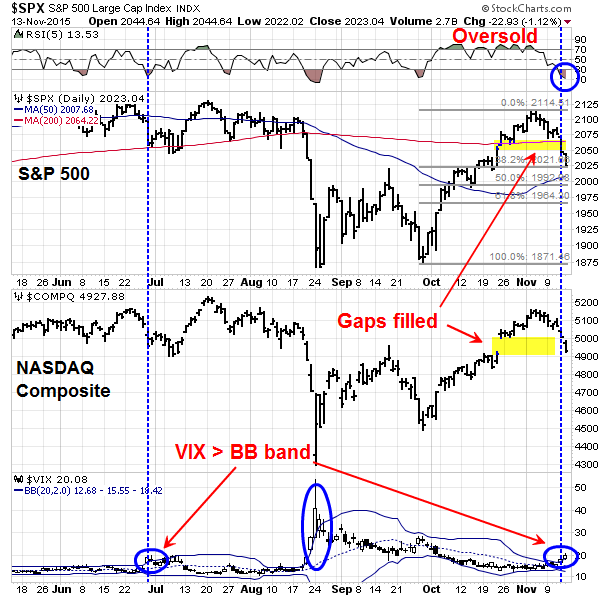 The market action last week saw some good news and some bad news. The bad news came in the form of weakness in the Greater China equity markets, but that was offset by the goods news of upside breakouts in Europe and a positive relative strength showing by US small caps. 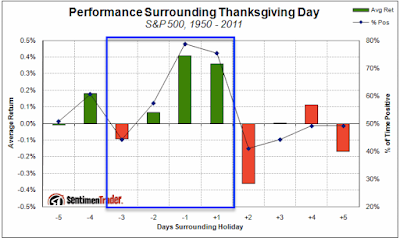 When I net it all out, I remain constructive that equity bulls will see another visit from Santa Claus this year. The complete post is at our new website here. In Canada, we had our Thanksgiving a month ago (because the growing season is shorter and it makes no sense to have Thanksgiving in November when it's freezing in much of the country). Nevertheless, in the spirit of American Thanksgiving, I reflected on what to give thanks about. In light of the events in Paris and Brussels, one silver lining in the world has been the dramatic slide in war deaths in the last half century. We haven't totally eliminated wars, but in comparison to the horrific carnage of the two World Wars, the modern era`s casualty rate is one thing to be thankful about. Continued at the new blog here. As regular readers are aware, this Humble Student of the Markets blog will become a subscription driven site on December 1 (see Why this isn't investment advice (and a site update)). The new site is live now at humblestudentofthemarkets.com, Come by and take a look and please change your bookmarks accordingly. If you have signed up for the Early Bird discount offer, we will be sending out an email with the full details this weekend. If anyone is interested, I will be in Seattle on December 3, 2015 for the Puget Sound MTA meeting. The feature speaker is my friend and former Merrill Lynch colleague Fred Meissner of The Fred Report. Cost: Free for Members and Non-Members. Please come by if you are in the area. Could the job market derail the equity bull? 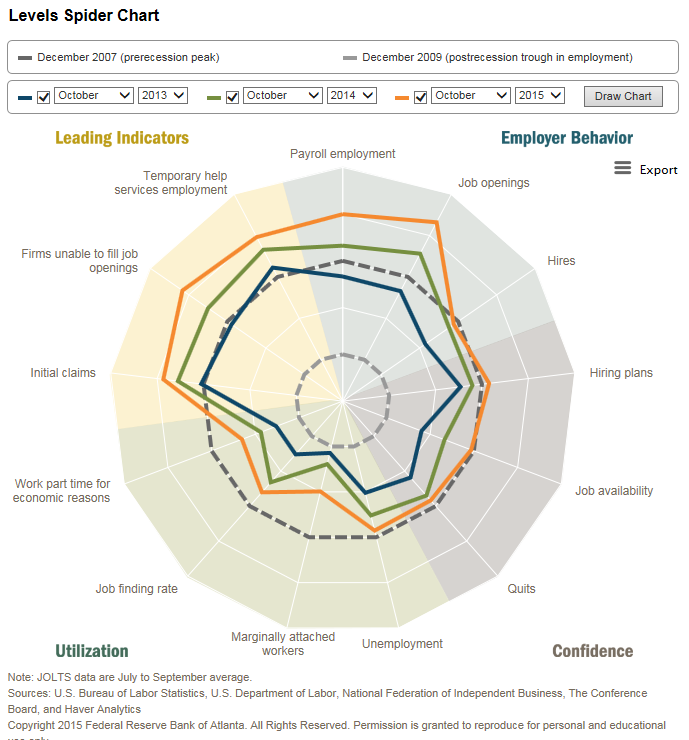 Recently, I have seen more and more concerns raised about the state of the employment market. Specifically, this chart of weekly initial unemployment claims (inverted scale) has had a tight inverse correlation with stock prices. 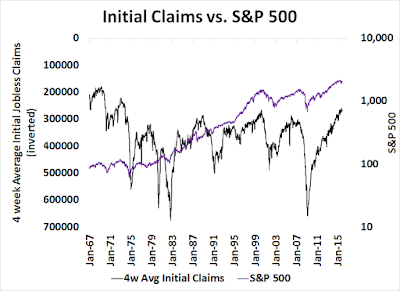 As weekly initial claims are already at 20 year lows claims will inevitably turn up at some point in the future. Will that rollover derail the stock bull? 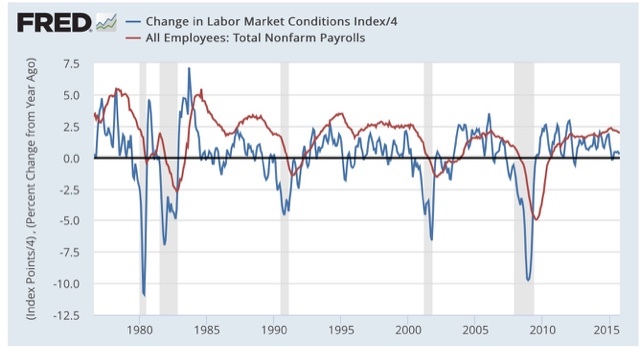 Doug Short put this data set into much better context with this chart of initial claims normalized by the size of the civilian labor force, which is another indication of how tight the labor market has become. Tom McClellan raised concerns too, though he was looking at the data through the lens of weekly claims compared to lumber prices as an economic barometer. Regardless, the conclusion is the same. Weekly initial claims are poised to start rising in the very near future. Don't go Zero Hedge on me! I think everyone should relax and take a deep breath. 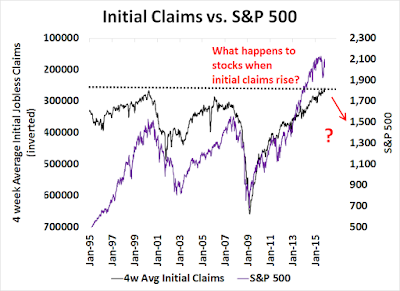 Sure, the 20 year chart of weekly initial claims data has been highly correlated with stock prices, but this correlation hasn't been as strong in other past periods. 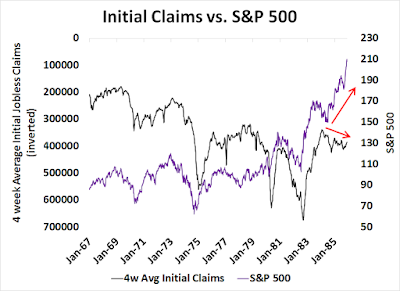 I went back to 1965, which was the start of the initial claims data history and analyzed the 1965-1986 period. Stock prices had a rough inverse correlation for much of this study period. 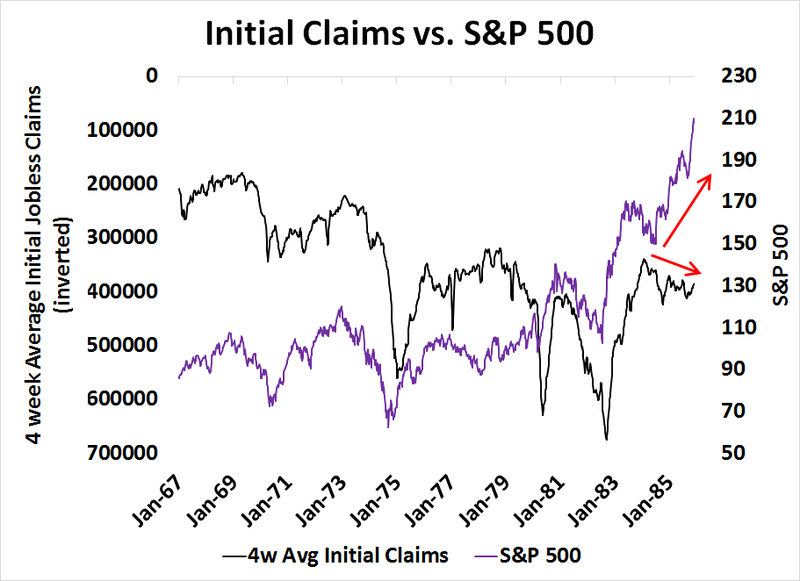 Then something funny happened in the mid-1980s as the recovery took hold - stock prices and claims went their separate ways as the inverse correlation broke down. 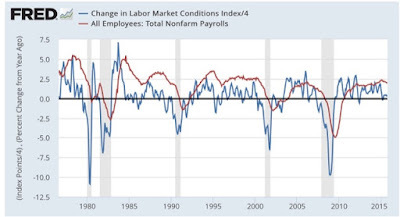 Put it another way, the economy was improving and the labor market tightened, but the stock market shrugged off the labor market effects because of an improving growth outlook. Fast forward to the 1986-2003 era, we can see this historic relationship breaking down even more. 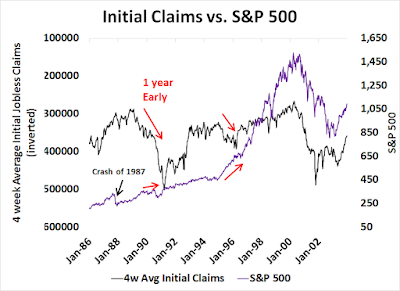 Initial claims started to rise (recall the inverse scale) in the late 1980s, but stock prices did not break down until about a year afterwards. 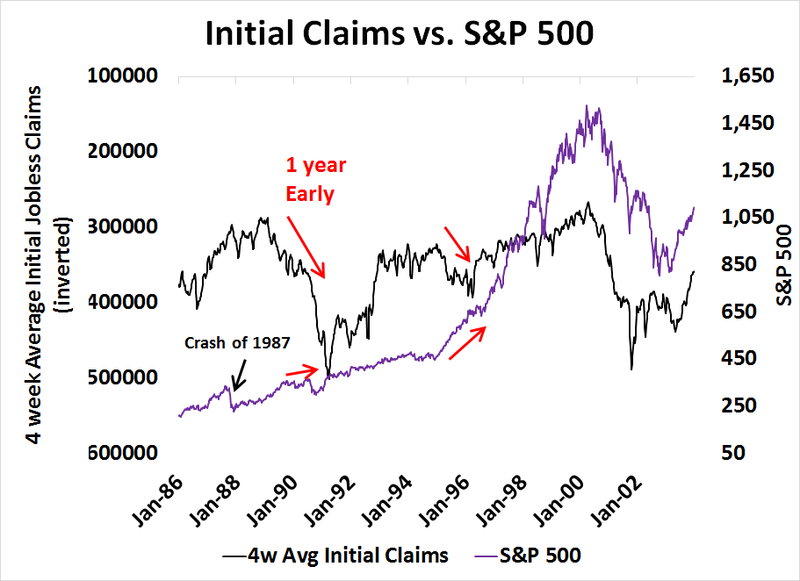 Claims were mostly flat in the 1990s, but stock prices went on a tear. Moreover, there was another episode about 1995 when claims rose but stock prices went up - until the inverse correlation re-asserted itself after the NASDAQ crash. Here is the chart of the entire history, does anyone really want to rely on this relationship to make an investment conclusion? So relax and don't panic and go all Zero Hedge on me. Here is what I think is going on. I concur with the more nuanced interpretation of current labor market conditions from New Deal democrat when he wrote that he was underwhelmed by the JOLTS report because hires were not rising along with job openings. 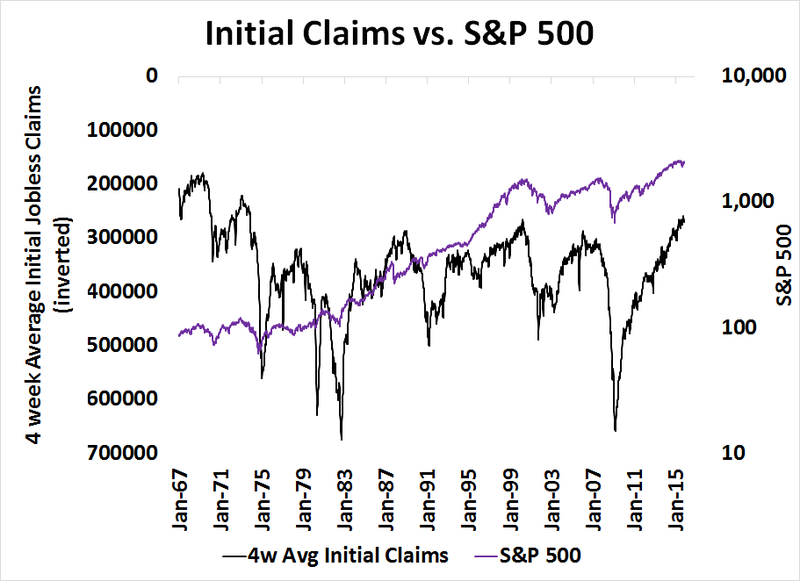 In other words, expect NFP to start weakening and weekly initial claims to start rising. 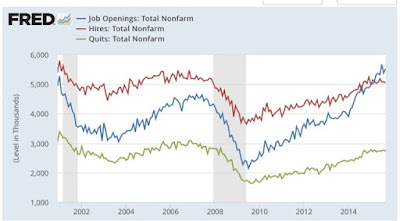 This is all normal behavior for a late cycle economy. Investors should not panic. In a late cycle market, inflationary pressures start to rise, such as wages which lead to cost-push inflation. Investors should therefore be positioned accordingly in late cycle sectors such as the capital goods and hard asset/resource sectors of the market (see my post Profiting from a late cycle market). The bull is still alive - at least for a few more months. Please watch this space for more updates as they are available. In the context of a strong momentum thrust from a market bottom, this chart is a good road map of what may happen next. We have gone through a brief period of consolidation and pullback. In general, the market tends to grind up from here. Sentiment models are also supportive of higher prices. 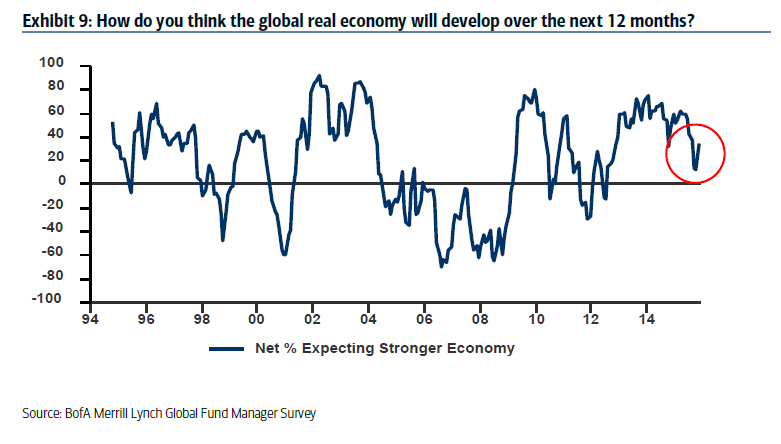 The NAAIM survey of RIAs show that sentiment has recovered from bearish extremes and they are trending bullish. 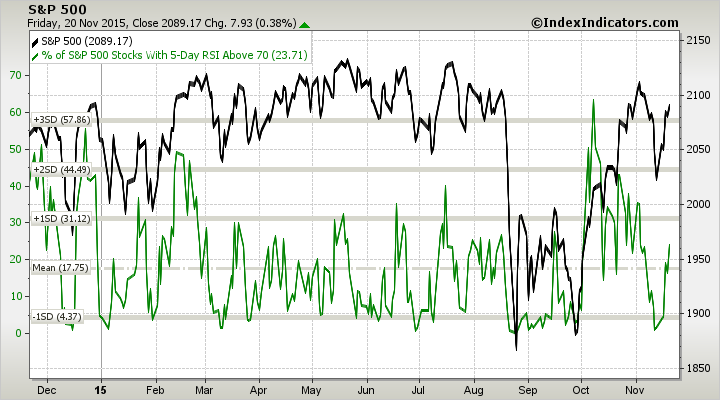 Risk appetite pulled back slightly last week, but they have further room to run and portfolios are not fully invested. 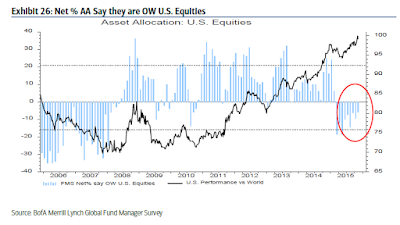 The BoAML Fund Manager Survey (FMS) shows that global managers remain underweight US equities, which indicates a potential for a bullish stampede as we enter a period of positive seasonality aided by the momentum tailwind of a Zweig Breadth Thrust. I am also encouraged by the latest readings from Barron`s of insider activity. 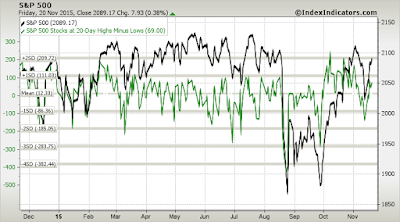 We have seen two weeks of heavy insider buying as the stock market has pulled back and consolidated its gains. The combination of bullish momentum, positive seasonality and improving, but not overbought, sentiment readings point to a grind up into year-end. I have also been advocating a rotation into late cycle commodity sensitive sectors (see Profiting from a late cycle market and Global reflation = Buy risk (and cyclicals)). That trade setup continue to develop. 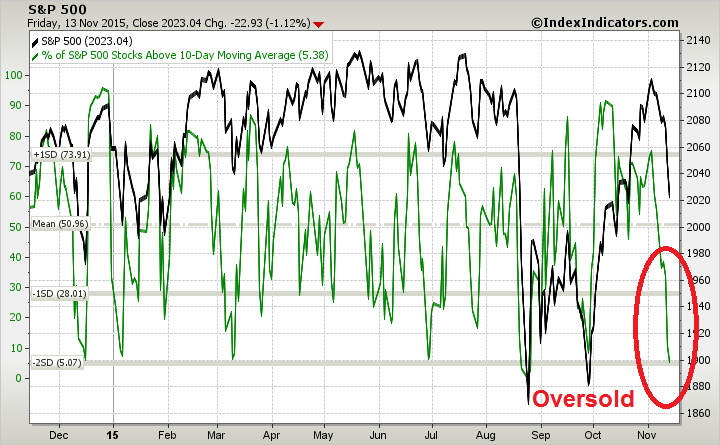 Technicians know that the an oversold and wash-out market combined with signs of reversal is a powerful buy signal. We are starting to see signs of that today in the late-cycle sectors. 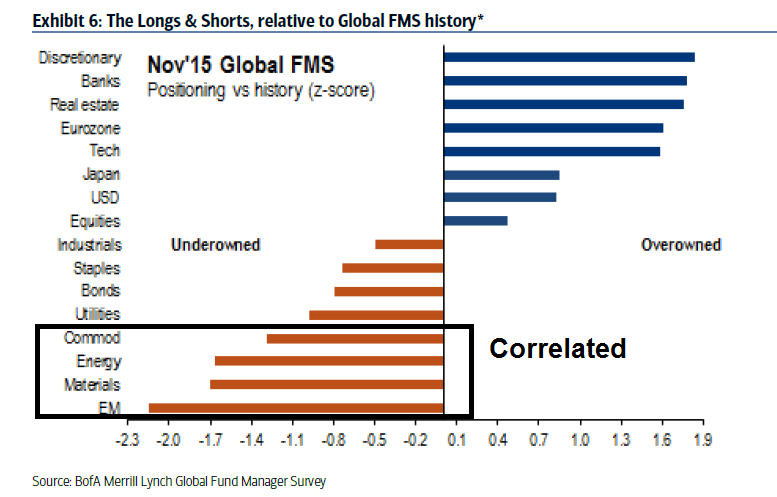 The BoAML FMS is instructive on sentiment. 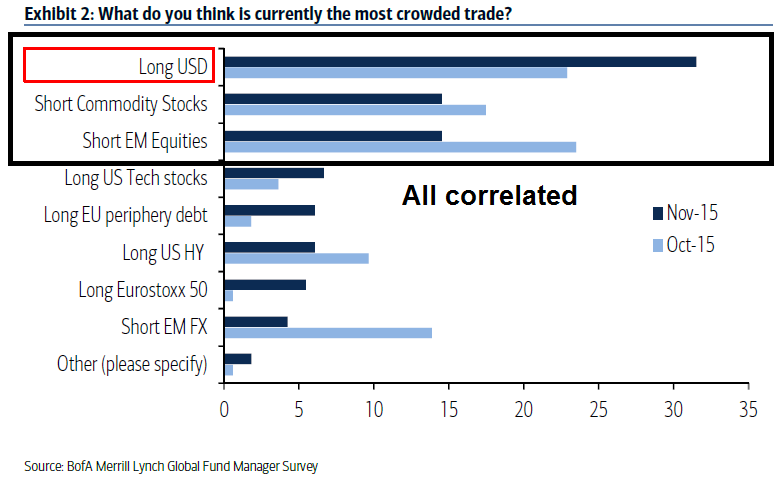 The top three most crowded trades of long USD, short commodities and short EM equities are all correlated and amount to the same macro theme. 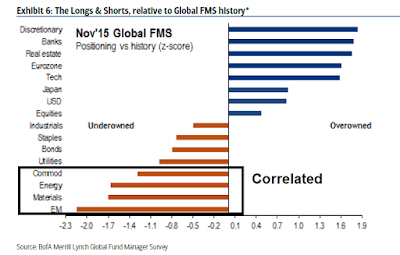 Fund managers' biggest over and underweight positions relative to their history reflect the unloved nature of these sectors. 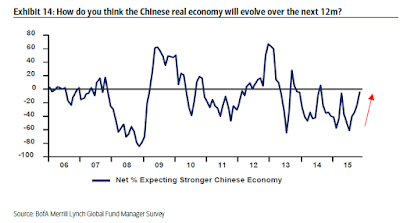 The elephant in the room has been China, but managers believe that the China growth outlook is stabilizing and recovering. I pointed out last week that Tom McClellan had identified a 10-month cycle in copper prices, which should be bottoming about now. McClellan also warned that he did not expect a durable bottom until we saw price capitulation, as measured by the 10-day rate of change. We may have seen that last week. In the past, copper prices have tended to rally whenever the 10-day ROC hit -10% (marked by the vertical blue lines). 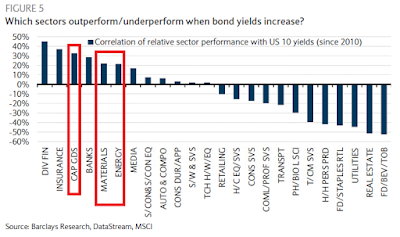 Sober Look also highlighted analysis from JPM indicating that cyclical stocks are beating defensive stocks as a sign of reflation. The issue of Fed policy has come up numerous times in discussions with investors about my bullish outlook on equities and commodities. I have been repeatedly asked the question, "The Fed is likely to raise interest rates in December, wouldn't that be bearish for stocks, bullish for the USD and therefore bearish for commodities?" Not necessarily. There are two parts to that question. 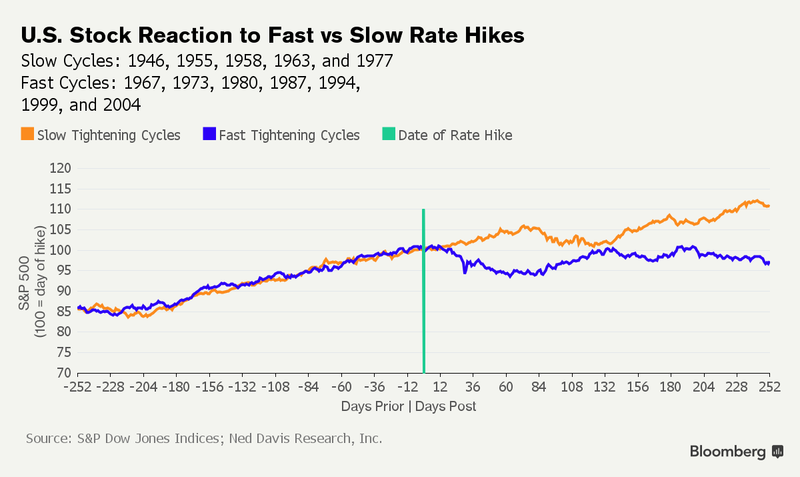 Historically, the Fed has begun a rate hike cycle when it sees inflationary pressures start to tick up. Everything else being equal, higher interest rates would be negative for equity valuations because E/P, which is the inverse of the P/E ratio, would fall and therefore depress P/E multiples. But everything else isn't equal. 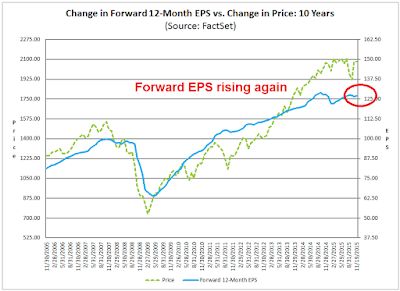 Typically, the negative effects of a slight P/E contraction are offset by better earnings growth, or bigger E in the P/E ratio. 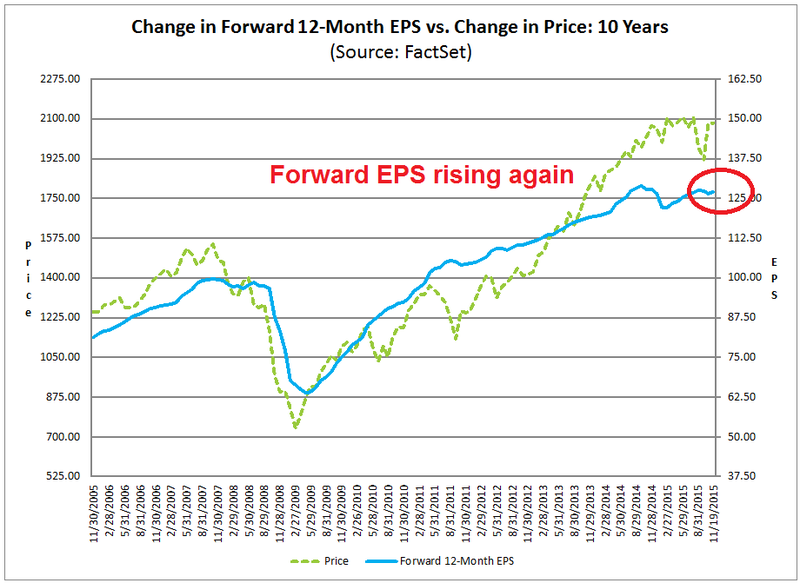 Indeed, the latest figures from John Butters of Factset shows that forward EPS estimates are rising again, which is equity bullish (annotations in red are mine). As well, the market discussion has moved on from the timing of the first rate hike to the pace of the rate hikes. 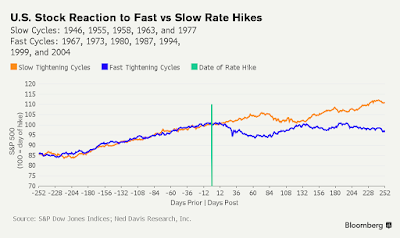 Ned Davis Research showed that the stock market has historically reacted much better to a slow pace of rate increases than a fast pace. 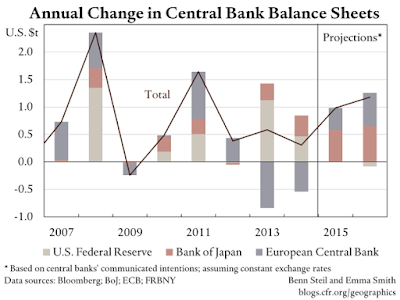 In the current circumstances, the Federal Reserve has made it very clear that the pace of tightening will be slow, measured and data dependent. What about the US Dollar? 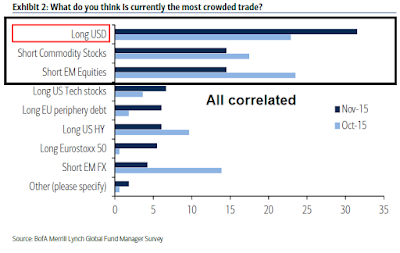 Isn't a rate hike USD bullish and therefore commodity bearish because of their inverse correlation? Not necessarily. The upcoming rate increase must be the most telegraphed initial rate hike in Federal Reserve history. The market will undoubtedly shift its focus to the evolution of the dot plots to see how quickly the Fed is likely to raise rates. Assuming that the FOMC does raise rates in December, the USD may very well see a reflex rally evaporate should Yellen makes it clear, as she is likely to, that the trajectory of future rate hikes will be slow and shallow. Looking to the week ahead, I am unabashedly bullish. The SPX rallied last week and regained its 200 dma. Momentum is positive but not overbought on RSI5. My preferred breadth metrics remain neutral to positive (see my recent post Don't worry about bad breadth for a discussion on my interpretation of breadth). 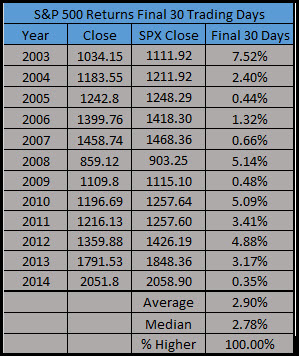 Ryan Detrick showed that we have seen a 12 year streak of positive returns for the final 30 days of the year. 2015 is not likely to be the unlucky 13th year given the strong momentum backdrop this year. ...or on a longer term (1-2 week) basis, but price momentum remains positive. Bottom line: Stock prices are likely to move higher. Both my inner investor and inner trader are bullishly positioned, with exposure to the market and in the commodity sensitive sectors of the market. As this site will become a subscription site in the near future (more details below), I was in the process of developing a standard legal disclaimer of why the content is not investment advice. Instead of just hiding behind standard legalese, I thought that I would write about the real issues that go beyond the regular regulatory framework. When you’re the Chief Economist at Merrill Lynch you think you’re the starting pitcher for the New York Yankees. You have it all figured out. I realized when I got to Gluskin Sheff how much I didn’t know. The whole life of a portfolio manager, their brain, is one giant distribution curve of outcomes. I’ve learned more in the past six years at Gluskin Sheff on the buy side, as a strategist and economist, than the previous twenty-two combined [in various sell side roles]. Because I figured out how to produce a forecast that’s meaningful for somebody who manages money for a living. The vast majority of the discussion on the internet and in investment research revolves around (1) of whether something represents a good investment or trading opportunity. That was the universe where Rosenberg spent most of his life before Gluskin Sheff. Unlicensed, but sometimes well-informed, advice: An example might be an wine expert stating, "XYZ Pinot Grigio has a nice fruity taste" without knowing whether you like wines, like fruity wines, much like whether a talking head on TV giving an opinion knows anything about an investment is suitable for you, because he knows nothing about you. Suitable advice: Stock brokers are held to a suitability standard, which means that he knows enough about you to say that an investment is deemed to "suitable" for you. Under the suitability standard, the client has final say on how much to buy and sell. It also means that, in theory, that if a $1 lottery ticket is suitable for a millionaire, then the broker is free to try to sell the millionaire a million $1 lottery tickets under this standard. Fiduciary advice: A fiduciary is in a position of "trust", which is a term that has legal implications. In general, you give a fiduciary, or portfolio manager, discretion on all three of the aforementioned steps. A portfolio manager therefore has to know a lot more about you in order to decide on how much to buy and sell and to build a portfolio with the appropriate expected risk and return characteristics. In my case, I know nothing about my readers and I am not licensed in any jurisdiction. Hence the disclaimer "this is not investment advice" is appropriate. I wrote before that I am in the process of turning Humble Student of the Markets into a subscription based website (see Humble Student lives!). I can now update my readers on the development progress of the new site. We are in the process of putting the final touches on the new website. While all the operational details will be accurate, I apologize in advance if there is any slippage in dates mentioned. The new site will be located at humblestudentofthemarkets.com. We are scheduled to go live in about a week and the readers will be able to subscribe on December 1st. All of the posts on the current (old) site will remain as an archive. There will also be a transition period of several months where the old site will summarize and link to fresh content on the new site. Free: For any content older than two weeks. If you are not ready to subscribe, you can still sign up for email notifications of free posts as they become available. Annual: USD 199.99 per year. Anyone interested can still email me at cam at humblestudentofthemarkets dot com for a discounted early bird offer (If you have already responded before, there is no need to do so again). Monthly: USD 19.99 per month, for anyone who is unsure about committing to an annual subscription. Day pass for 24 hour access: USD 4.99 for anyone read the summary and wants to see more. When I first began writing Humble Student of the Markets, it was just an avenue for me to get my thoughts out. However, with the previous discussion about the appropriateness of investment opinion and advice above, I have concluded that the greatest value that I can offer isn't just me talking out loud to my readers, but to engage them in a conversation and to build a community. I hope that the new Humble Student of the Markets moves beyond a simple subscription site to a moderated community of investors sharing ideas. I have therefore decided to open the site to subscribers as of December 1, 2015 and stop accepting new members on January 15, 2016 to better control the growth of this community (day passes will still be available). I will take a couple of months to assess how the new members are interacting before opening up the site to new members again. Recently, I have been seeing more and more bearish warnings from chartists about deteriorating breadth (example here). Even though I am bullish, I always pay attention to people who have the opposite viewpoint to make sure I didn't miss anything in my analysis. Much of the concern stems from the deteriorating breadth shown by the NYSE Advance-Decline Line, which has been showing a series of lower highs and lower lows. The NYSE A-D Line is based on the components of the NYSE Composite, which is a broad based index with many more stocks than the SPX. 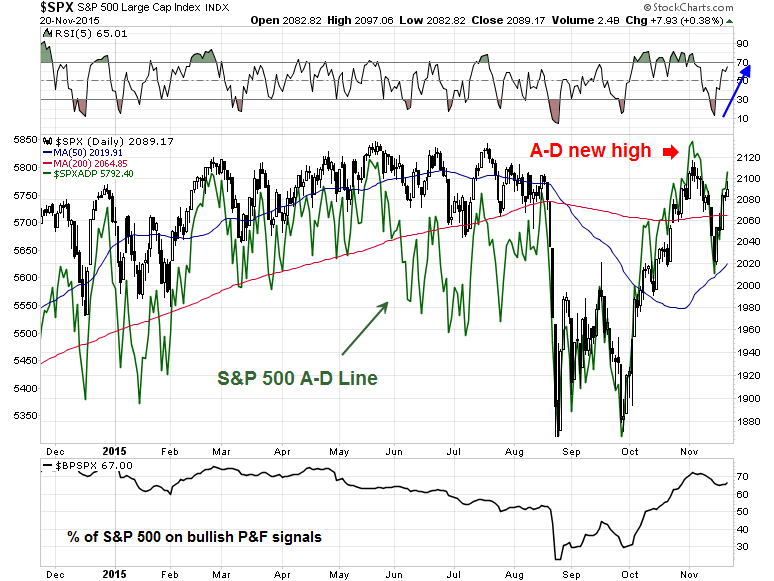 On a hunch, I decided to look at the SPX A-D Line, as an apples-to-apples comparison for the SPX. 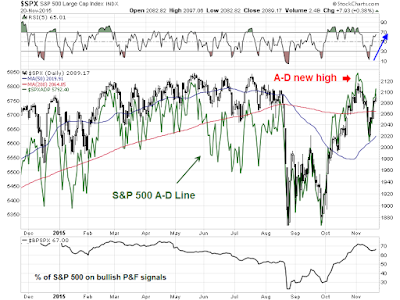 Lo and behold, the SPX A-D Line actually made a new high in the latest advance from the August low, which confirms the strength of the rally. 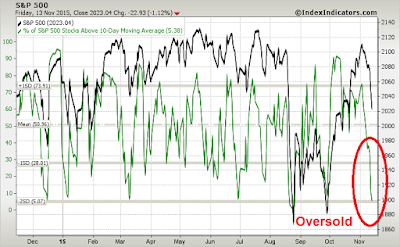 As well, the % bullish metric (bottom panel) is not showing any negative divergence either. What's going on? One of the criticisms of the NYSE Composite is that it has a number of closed-end funds, whose price action may not be relevant when calculating an A-D Line. As well, the NYSE Composite has more small cap stocks, which does measure whether the "generals" or the "troops" of the market are leading the latest advance - that's what we are really trying to measure with breadth. The chart below shows the NYSE Composite to Equal-weighted SPX ratio as a way of measuring the small and large cap effect. 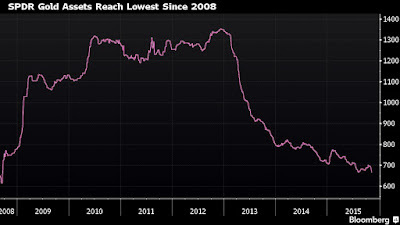 As the chart shows, this ratio has been falling since the 2009 low. 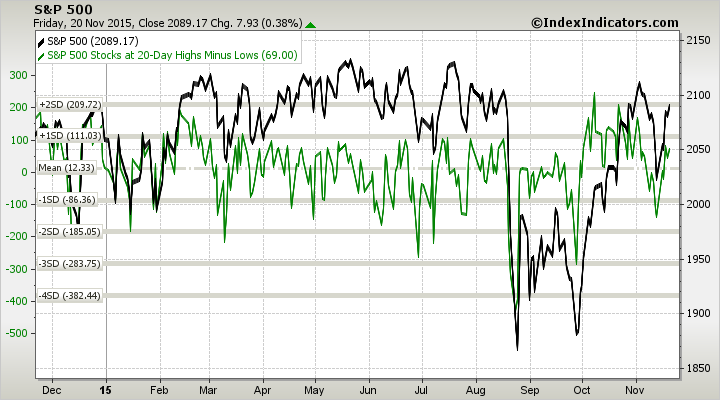 Can this (and therefore the NYSE Composite) be a trustworthy indicator of market breadth? Another way of thinking about underlying strength of the "troops" and "generals" is to look at the relative performance of small and large cap stocks. The chart below shows the Russell 2000 to SPX ratio. In theory, improving market breadth, as measured the small vs. large cap ratio, "should" be a signal of underlying strength. 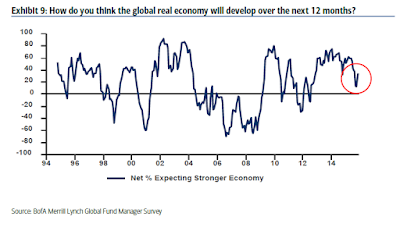 The history of this indicator has had a mixed result in the last 20 years. Large caps dramatically outperformed small caps during the Tech Bubble of the late 1990s and underperformed in the bear market afterwards - which were false signals. On the other hand, this ratio did flash advance warning of breadth deterioration leading into the 2007 top. Today, it topped out in late 2013 and it has been showing a series of lower highs and lower lows. In summary, evidence of deteriorating breadth comes mainly from broad based indices like the NYSE Composite, which is really a measure of small vs. large cap performance. 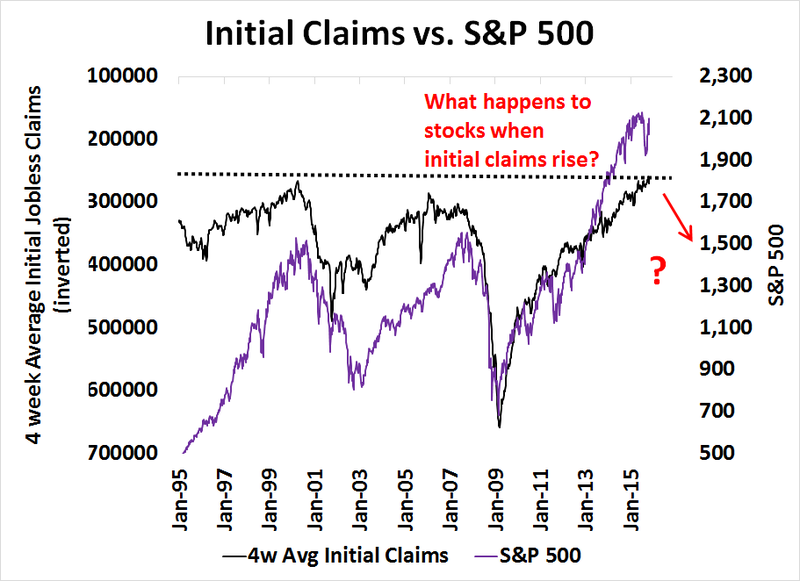 This has shown itself to be a unreliable indicator of market tops. An apples-to-apples measure of SPX breadth using SPX only components made a new high during the most recent advance, which confirms the strength of the rally from the August bottom. 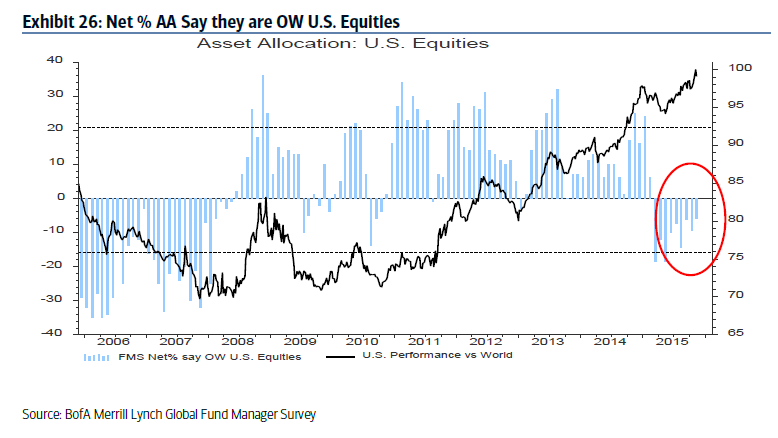 Based on this analysis, the US equity market should have a bullish tailwind this week. 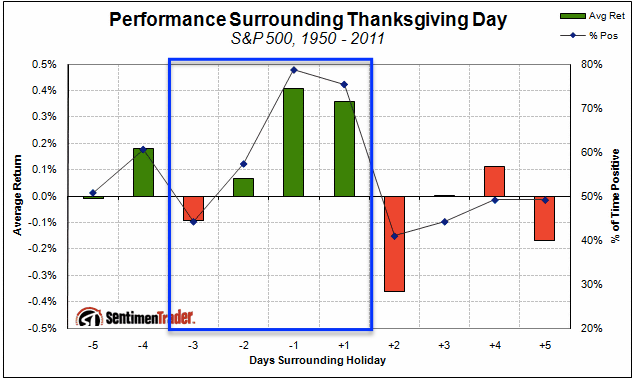 Moreover, next week is Thanksgiving week, which is also seasonally bullish. The path of least resistance for stock prices is therefore up. I would also add that in the late part of the expansion, excesses start to appear and sometimes begin to unravel, which is what we are starting to see today. Examples include record levels of Mergers and Acquisitions; wounded and dying unicorns and the growing sense of panic in Silicon Valley (via Luke Kawa), as exemplified by Fidelity`s 25% writedown of its Snapchat stake; and the frothiness seen in the art market. Negative swap spreads, which is signaling a possible lack of liquidity in Treasury paper. Fractured repo rates, which is also a sign of limited liquidity. Corporate bond inventories below zero, ditto. Synthetic credit is trading tighter than cash credit, which is also a sign that the market is paying for liquidity in the form of tighter spreads. Market moves that aren't supposed to happen keep happening, which can be caused by illiquid markets failing to clear at critical periods. Volatility is itself more volatile. On top of that, we are seeing signs of other excesses. 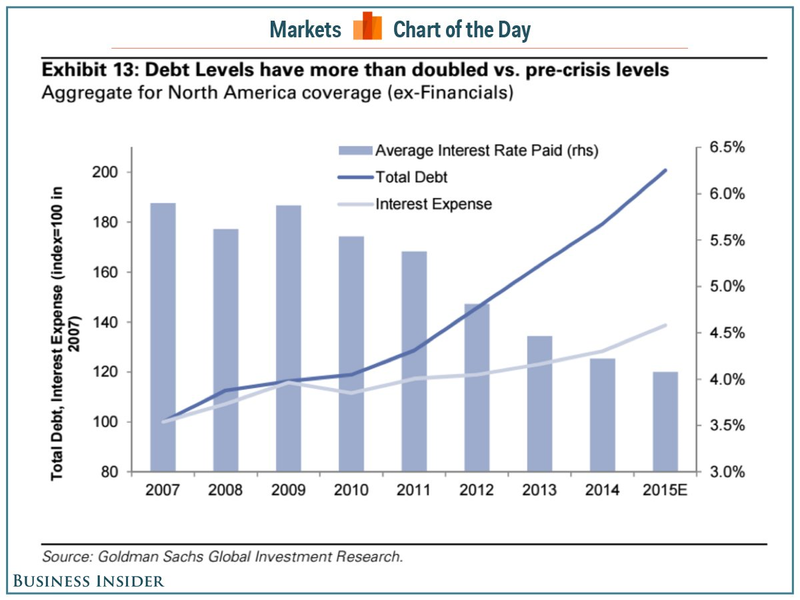 Corporate leverage is rising, which is a logical response to the ultra-low rates of the last few years (via Business Insider). The combination of these factors are just indications that the credit markets are fragile. A good analogy might be riding around in a motorcycle at high speeds without a helmet on. Nothing will happen to you unless your crash. In that case, the outcome might not be very pretty. 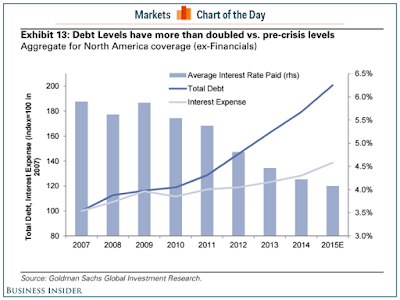 With the recent back-up in both IG [investment grade] and HY [high-yield] spreads to their respective 3.5-year wides, a discussion has emerged about whether the market is sensing the next default cycle around the corner or is simply “overreacting” to some exogenous but ultimately irrelevant events. At 570bp ex-energy spreads, the market is well ahead of what would normally be considered sufficient compensation for defaults that are still tracking sub-2% in this segment of our markets. Strategists Oleg Melentyev and Daniel Sorid looked at six leading indicators to judge whether the credit market has over-reacted, and found that two are flashing red - meaning they are "at levels consistent with where previous credit cycles have started." 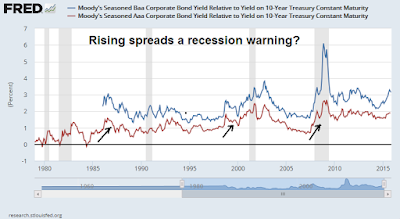 The two signals flashing red are volatility shocks, and spreads on the highest rated corporate bonds. As the chart at the bottom of this page shows, the Vix and spreads on AA-rated corporate bonds are moving in a similar fashion to the late 90s and the years leading up to the financial crisis. Two other indicators - financial stocks and monetary policy - are flashing yellow, meaning they have shown some signs of deterioration but are not yet at stressed levels. Two other indicators - volatility in Treasuries and issuer fundamentals - are sending no warning signals. The message from the credit markets is indeed worrisome. Yield spreads are rising across all credits, from investment grade to high yield. 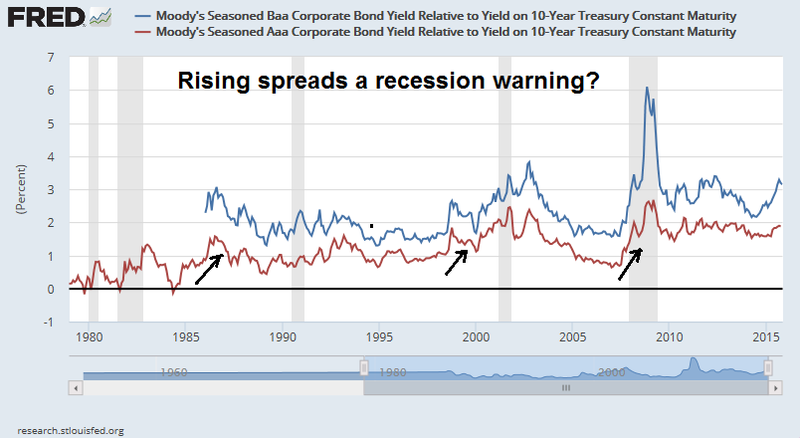 History shows that rising spreads have been a precursor to economic recessions, which are bull market killers. However, this signal has been very early in its recession warning in two out of the last three economic cycles. My interpretation of current conditions indicate risks are rising but we are in no imminent danger of an economic downturn. Instead, the US economy is entering the late cycle phase of the economic expansion. Inflation is dead, long live Inflation! The "normal" way of playing a late cycle expansion is to rotate into the deep cyclical sectors, such as energy and mining. 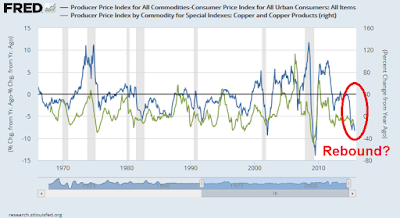 However, I have been seeing charts like this last week (via Jereon Blokland) indicating that commodity prices are hitting new lows, which is undoubtedly giving many investors pause. Is asset inflation dead, or are commodities a contrarian buy? I believe that this is setting up to be a classic contrarian value play, which can be defined as putting on a position that makes you distinctly uncomfortable. This value investment theme was reinforced by the news that billionaire and deep value investor Seth Klarman had bought a 53 million share stake in Alcoa. "The market is way too bearish on U.S. inflation in the medium term," meaning between five and 10 years, said Silvia Ardagna, an analyst in London with Goldman Sachs, one of the 22 primary dealers that trade with the Fed. A rebound in the bond market’s inflation view would signal rising investor confidence in the Fed’s ability to increase interest rates without derailing the economy. Stronger-than-forecast U.S. jobs data on Nov. 6 backed up the case for the central bank to boost its benchmark rate from near zero at its meeting next month. A turnaround in the inflation measure could happen quickly because the gauge is so low compared with where the bank assesses fair value -- a statistically rare two standard deviations away -- according to Ardagna. "When an asset class in our space is this misvalued relative to its fair level estimated with our model, usually a reversal tends to be pretty fast," she said. 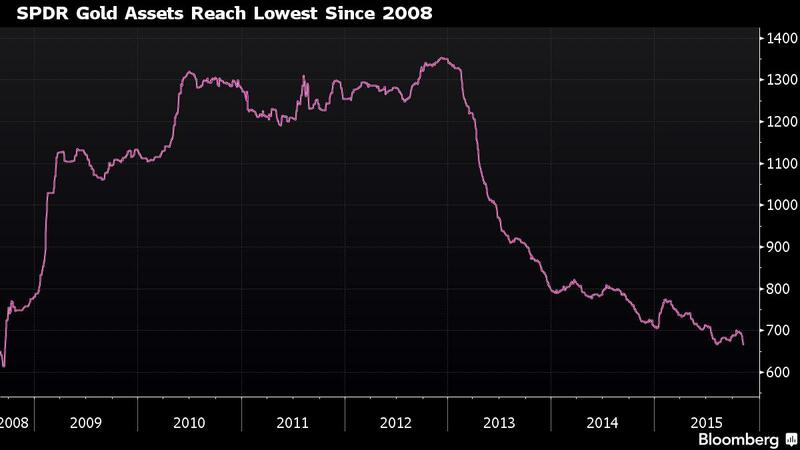 The 10-year break-even rate hasn’t traded at 2 percent since October 2014, when crude oil was above $90 a barrel, compared with about $42 Thursday. Investors should exit the trade if the break-even closes below 1.4 percent, according to the bank. Is inflation truly dead? The Atlanta Fed's labor market spider chart shows steady improvement on all dimensions, indicating imminent wage and cost-post pressures. From a chartist's viewpoint, the relative performance of late cycle sectors is becoming more constructive. This 20-year relative performance chart of energy stocks to the SPX show that energy is testing a relative support zone with signs of positive RSI divergence. I am also seeing a similar pattern of positive divergence on the relative performance of gold stocks as they test relative support. This chart of the spread of PPI to CPI (blue line) shows that it is at levels where it has historically rebounded. The green line depicts the YoY change in the important industrial commodity complex, copper and copper products, which is poised to rise. The 10 month cycle in copper price bottoms says that a bottom is due imminently. But we are not yet seeing a big negative reading on the ROC to say that we have seen a washout selloff. When that washout eventually comes, there will likely be some big geopolitical or economic news to justify the selloff, and to help facilitate the washout selling wave. So when you hear that the sky is falling in the copper market, that will be the signal that the bottom is almost at hand. I expect that late cycle sectors like capital goods and commodity producers should be the surprise winners over the next 6-9 months. Investors should be accumulating positions now, while traders may either wait for oversold extremes or a technical breakout before buying. Last Sunday, I postulated that stocks would see some consolidation and pullback, which is exactly what we saw in the week (see Global reflation = Buy risk (and cyclicals)). The weakness overshot my targets, however, as I expected initial SPX support at 2055-2060 to hold. Instead, the SPX retreated and tested the first Fibonacci retracement level of 2020. 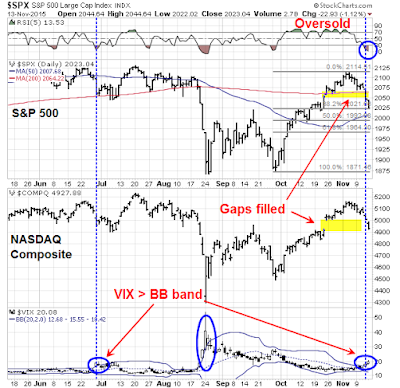 Readings are oversold on RSI5 and the VIX Index, which is now above its upper Bollinger Band. 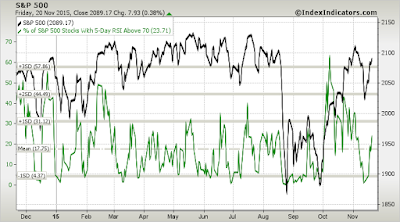 Breadth measures such as this chart of % of stocks above their 10 dma on IndexIndicators are at levels where stocks have rallied in the past. These oversold conditions suggest that any stock market weakness in reaction to the Paris attacks should be viewed as temporary and a buying opportunity. On an intermediate term basis, I view the market action last week in the context of a breather in the wake of a Zweig Breadth Thrust, which is a powerful bullish momentum signal that lasts many months (see Bingo! We have a buy signal!). My inner investor remains bullishly positioned in stocks. My inner trader was averaging in as the market weakened last week. He bought a small position in gold stocks on Tuesday, bought SPX on Thursday and added to his long energy positions on Friday. 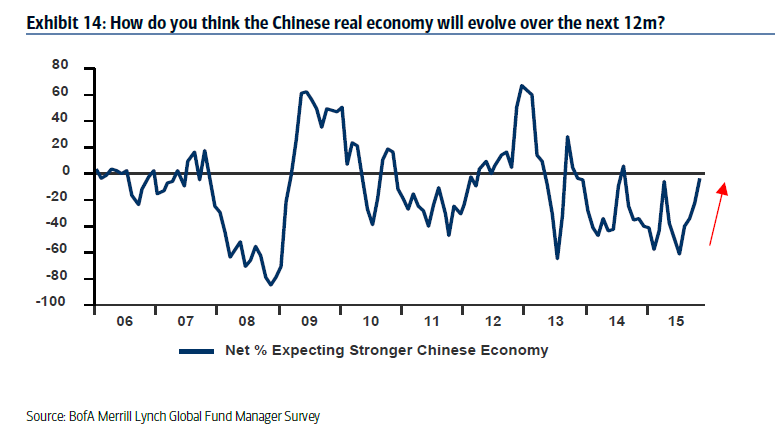 How worried should we be about a China slowdown?